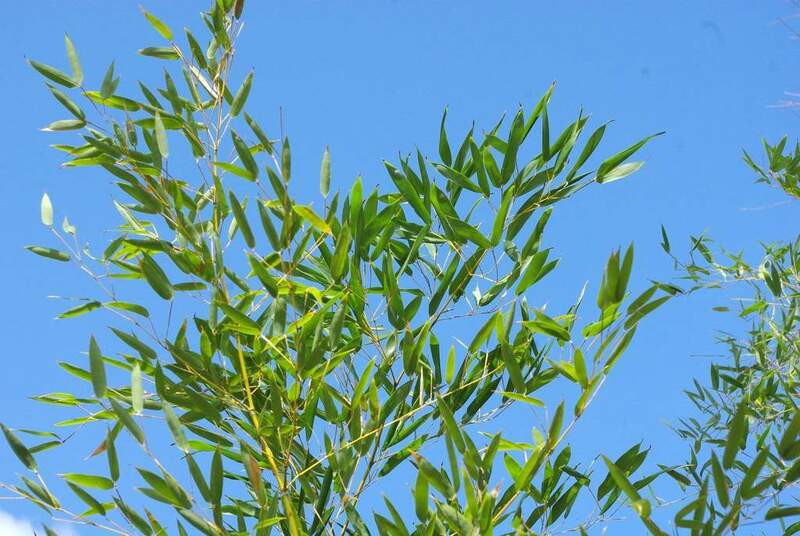 Have you noticed that I have a lot of posts about bamboo? 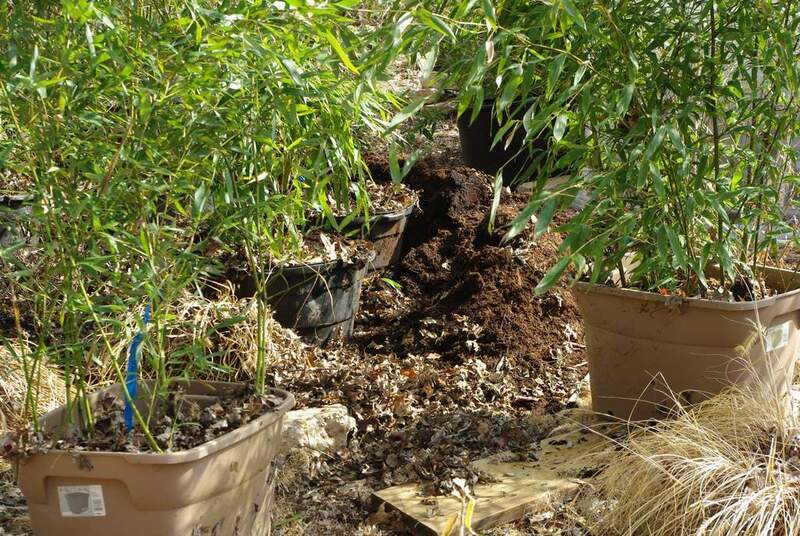 Well get ready for a bunch more over the next month or two, because things really start to happen with temperate bamboo in the spring. 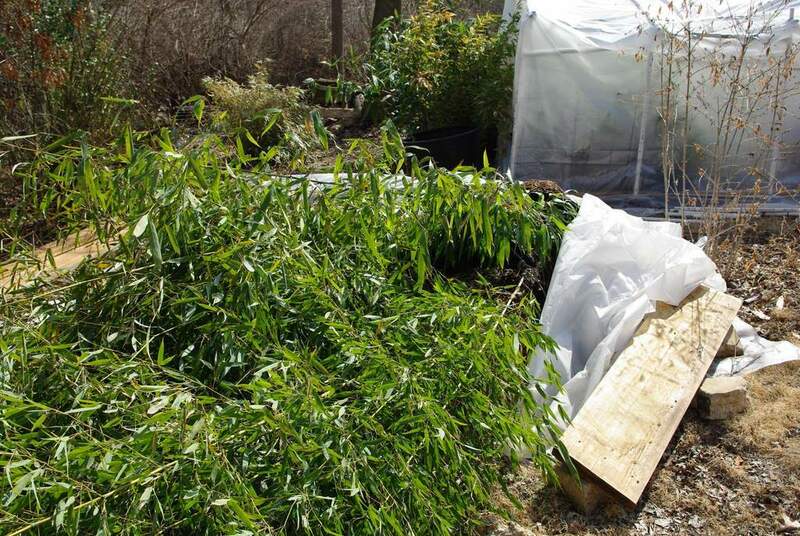 A lot of things also get done to the bamboo in the spring (by me), like the other day when I spent some time picking up all of the large pots that I had laid down and tarped over for the winter. 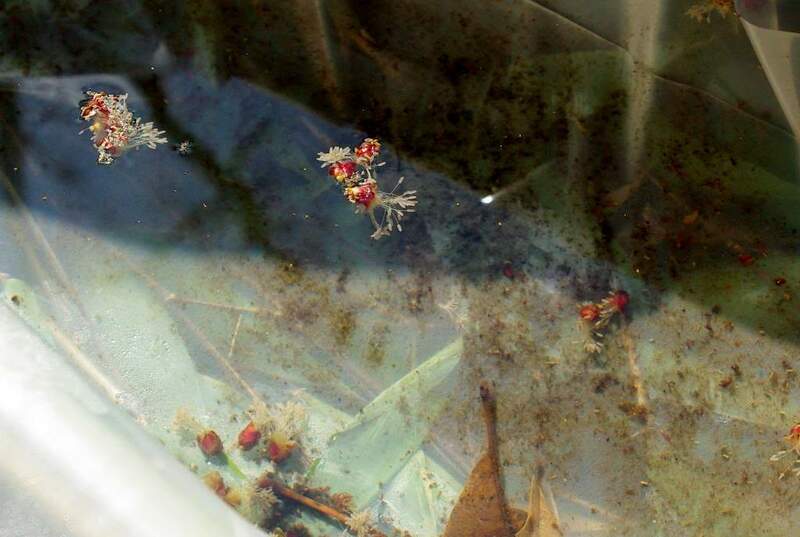 I uncovered them a few weeks ago when the weather was unseasonably warm, but I didn't pick them up at that time. I probably could have, but I wanted to wait a few more weeks until the threat of a really cold spell (20ºF/-6ºC) had passed. The other reason I didn't pick them up immediately is that it's more work than it sounds like it should be. Why? First, these are mostly large pots, 20 gallons or more. They're heavy! 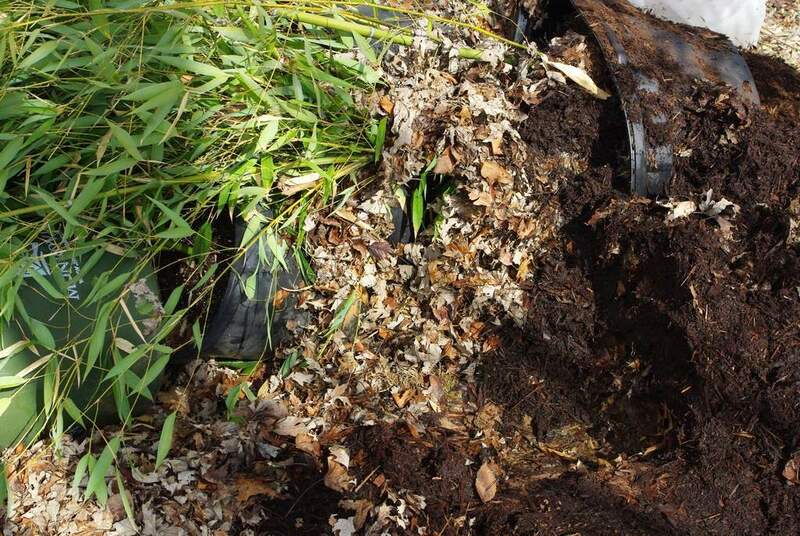 Second, they're buried in mulch and leaves, so some digging and raking will be involved. Third, there are many pots jammed in there, so there's a bit of untangling and thinking to get things out in the right order (the reverse of the order in which they were put in). 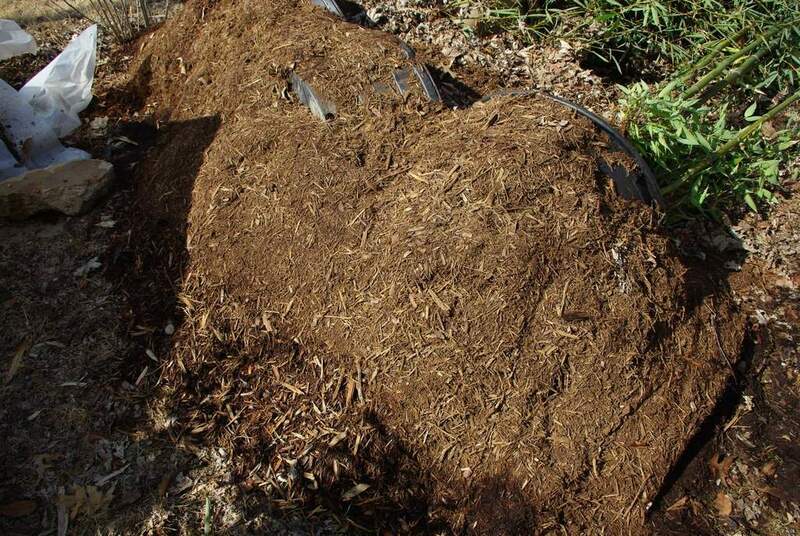 But there's no real trick to any of this, and after a few minutes I've got them upright, surrounded by a good amount of mulch. It's so nice to stand under these plants, look up, and see this greenery. It's a fresher shade than the bamboo leaves that stayed outside in the elements all winter. More "spring-like" I guess. 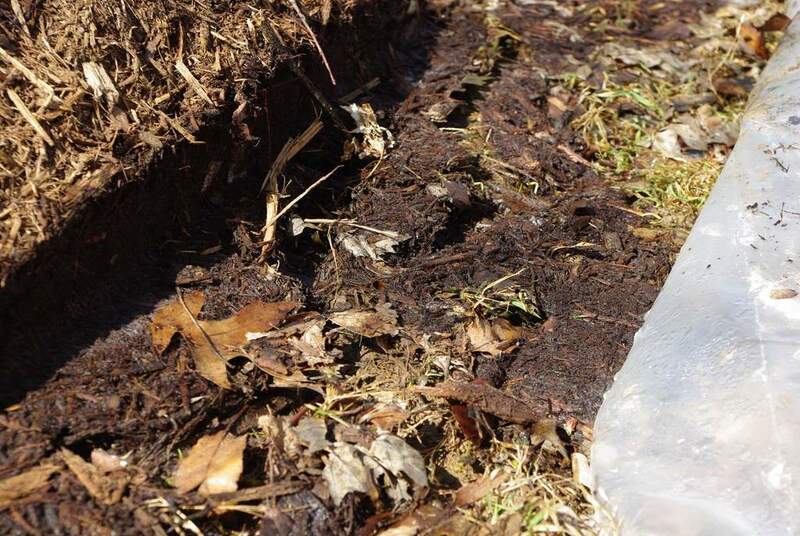 The plastic on the second pile had caught quite a bit of water in some places. Hey, I got a new water feature without any effort at all! 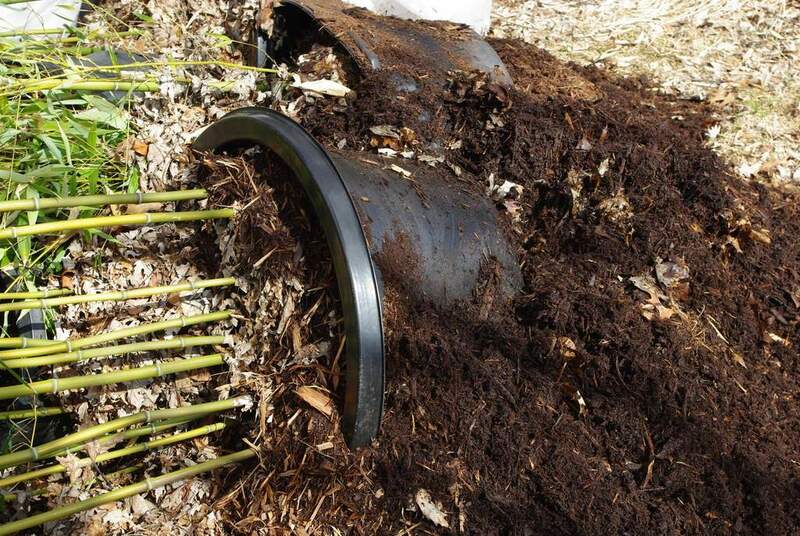 Those tunnels lead right into the mulch that is piled around the pots. 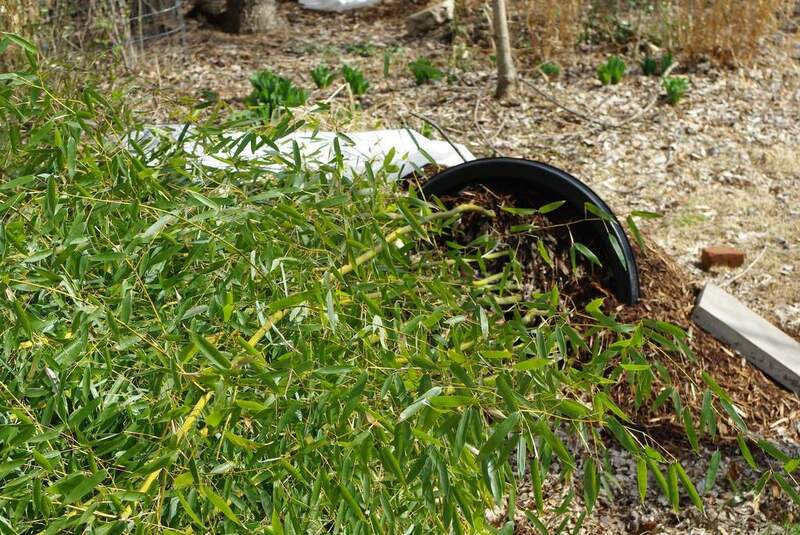 That's one thing that I worried about when I covered these -- that the mice and voles would move in and feast on bamboo roots and rhizomes all winter long. 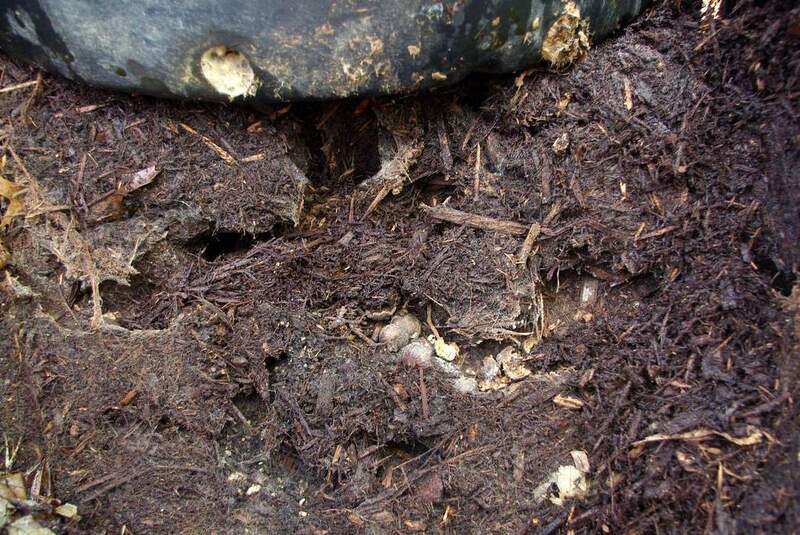 The mulch is an ideal nesting medium for them. I guess I didn't have to worry -- it looks like these guys preferred eating acorns. You can see several of them in the one tunnel. 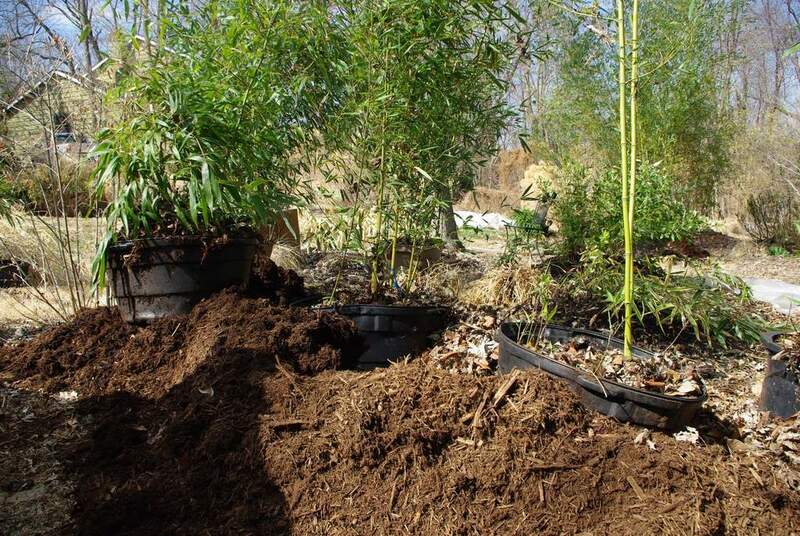 but still, nothing tricky about this as long as you don't mind getting a little mulchy and don't mind having to roll, tip, and drag large pots around. I did have my fingertips slide off of the pot edges a few times, which was surprisingly painful even though I was wearing gloves. No damage done, and I can stake it up if I want it more upright. 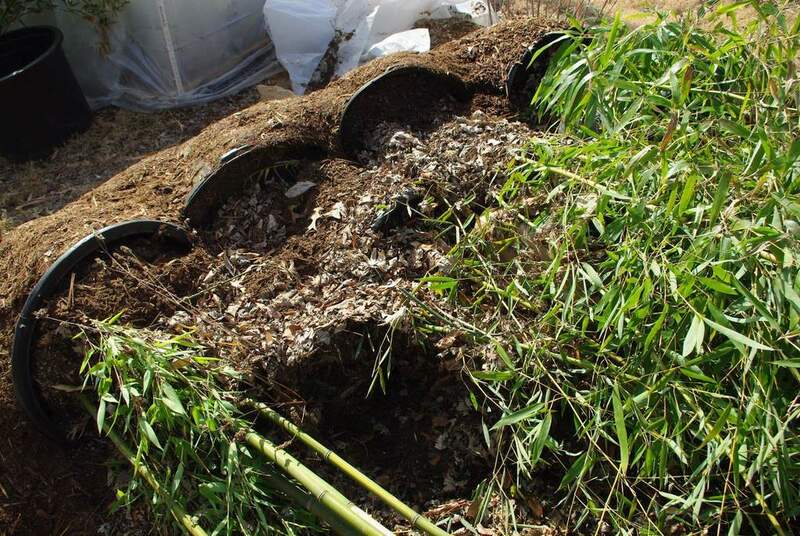 Other bamboo growers have mentioned that voles or other rodents really love to eat the rhizomes of this plant (Hibanobambusa tranquillans 'Shiroshima') so I was concerned, but I tugged on all of the culms and they were still well-attached. 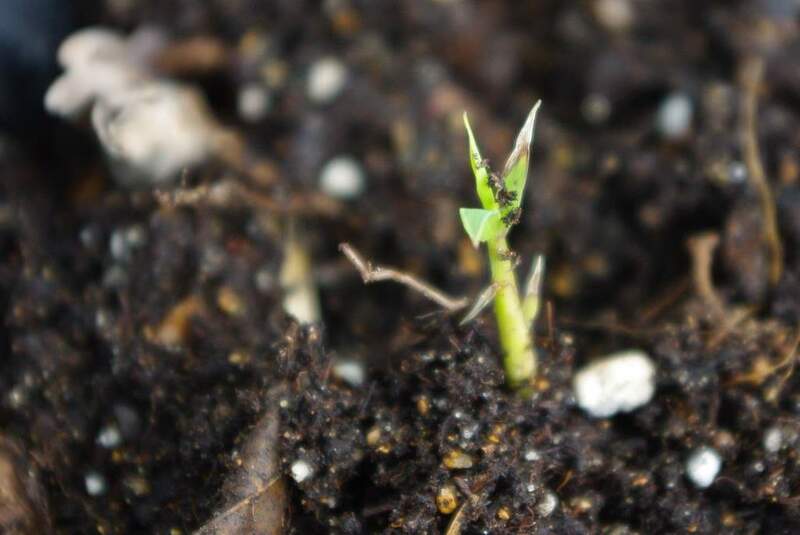 I've also heard that rabbits love the new shoots of this species, and that deer will eat the newly-emerged leaves. I'm going to have to put up some fencing around it while it's shooting I think! So that's the job done, until I decide where to spread the mulch. 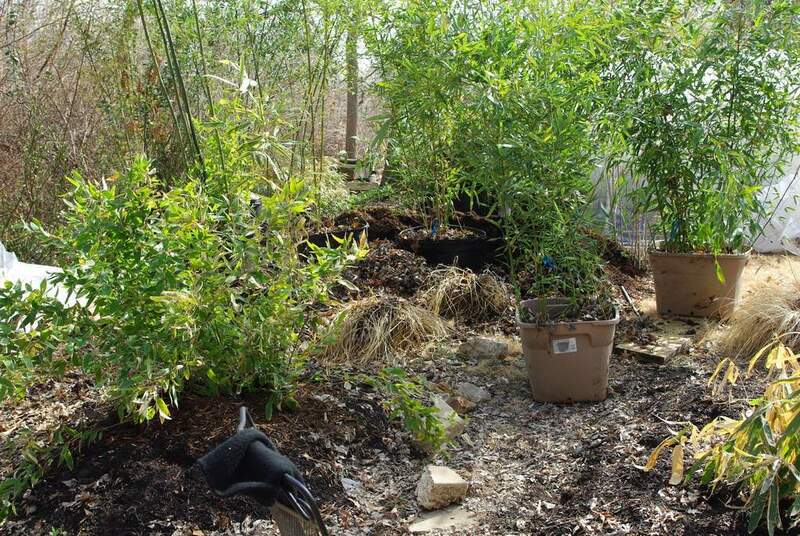 Although I can't say that this part of the garden is looking "good", it's definitely nice to see more bamboo back here again. 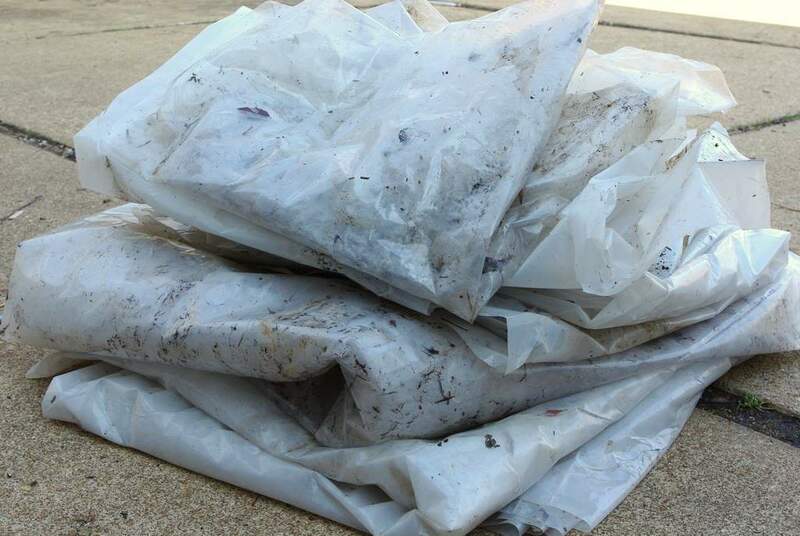 It's also nice to have a lot of the plastic out of the yard and put away in the garage. As if the garage doesn't have enough garden-related clutter in it already. Yeah!!! Great looking plants. It was awesome to see so much green. Which of these will go in the ground? Lining the border with leaf bags works too. I just have to go around to other houses and pick them up. These leaves will eventually just go in my compost pile. Been looking at some of your posts. I think it's great you like to experiment. 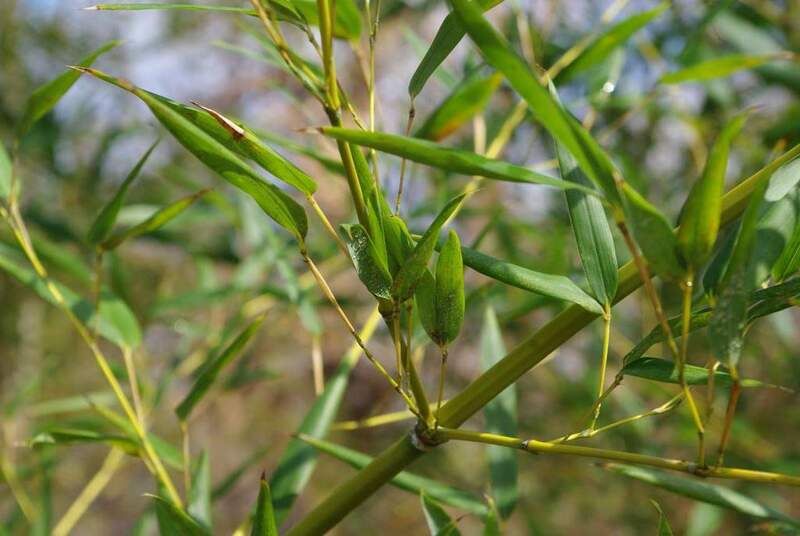 Interested in seeing your Bamboo updates...love to see how they work in the garden. No,pruning the daisies didn't smell like tar but then again I can't smell anything right now. I don't know which will go into the ground. Several of them won't, at least not here. I may give them away and/or try to sell them. I don't have unlimited space, but I may be removing a couple of species this year if they don't size up, and that will make space for a few of these. Pruning Montauk daisies always smelled like tar to me. I can't remember if that's the reason I got rid of them. 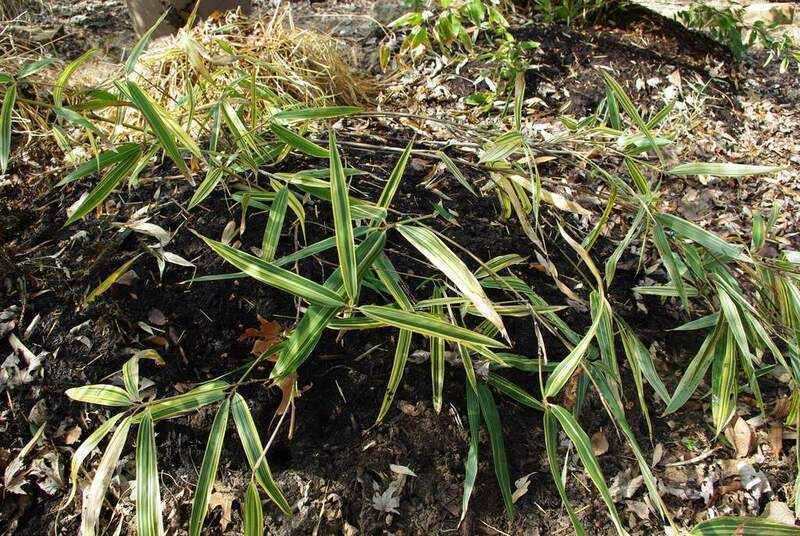 Donna: those "ground cover" bamboos can easily get out of hand and take over more garden area than you want them to. 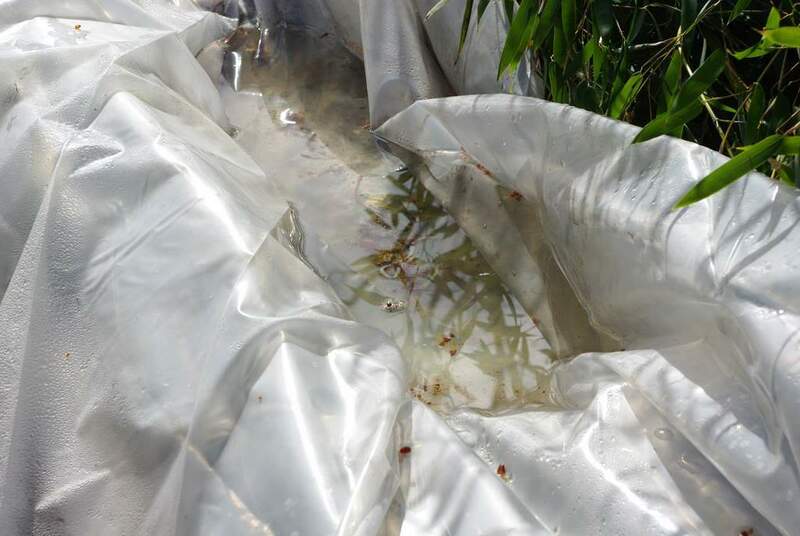 As an experiment, find a line near the bamboo that you don't want the bamboo to cross, then run a trowel or cultivator down that line, getting 4" deep if possible. 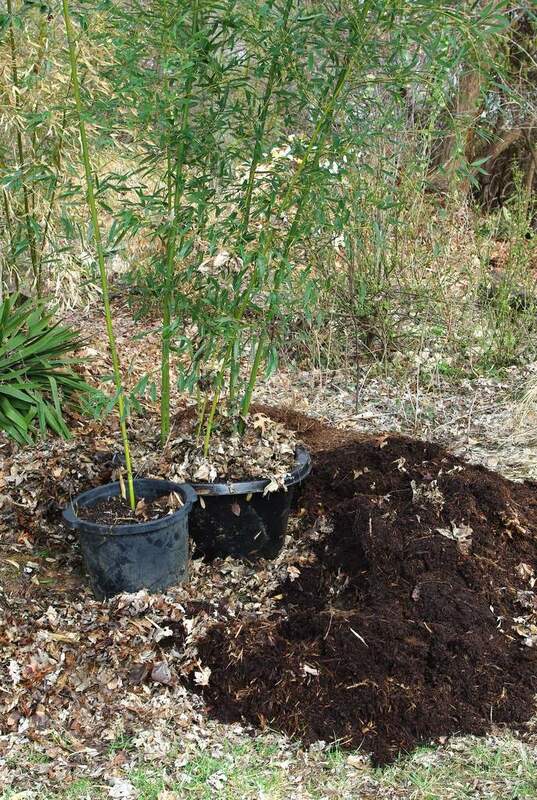 Chances are you'll find plenty of the bamboo rhizomes. The rhizomes often spread much further than the shoots indicate.